Oh nuu! In all his hopping excitement to hand out little chocolate versions of himself and peeps to the shop owners, the Easter Bunneh bounced Eggs all over the sims! Find and return them to their owners for an Easter surprise of your own! 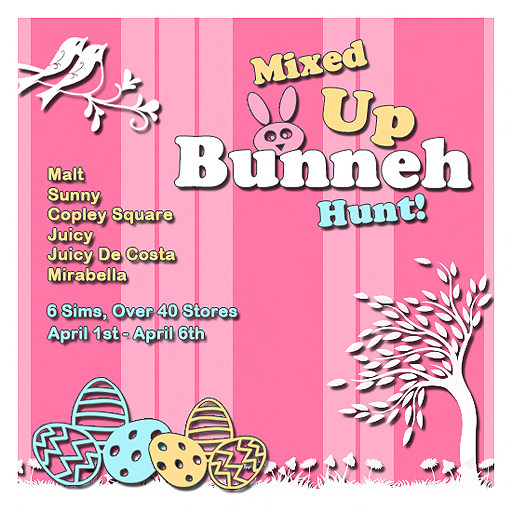 Hidden on each of the 6 sims will be a number of Easter Eggs spread out by the Bunneh. Help these top-notch clothiers, interior designers, accessorizers and so much more find and return their Eggs to the baskets by their stops entrance. There will be an information board by the TP point of each participating sim to provide detailed instructions. The hunt starts Wednesday, April 1 and runs to Tuesday, April 6, so don’t miss your chance to take a big bite out of the fun! PSST its Thursday the 1st April, and some of the eggs aren’t buy able yet , yes i know i’m eager and people are sleeping! but i want sweet goodness early! A friend and I spent a few hours on this. We like a challenge, but this was kind of ridiculous. For so few items, you guys really should have made a few clues for each sim. After several hours, we only managed 4 at the Juicy sim and 5 at the Sunny sim. Some excellent gifts in this hunt, very high quality! The one above is one of my favorites. My friend and I have been hunting for the last two days. Definitely worth the work but it is work. Sadly, not all the givers “work”. I found several eggs on the copley square sim and they eggs did not give out their prizes. Might not be the fault of the hunt organizers. SL is very lagalicious today. I don’t know who to relay my frustrations to but all-in-all it was a fun hunt gone wrong. Many eggs I found had something wrong with them (they wouldn’t give the folder, they’d give a folder but not the egg for turning in, duplicates of eggs, or the baskets for the prizes weren’t working). I was really excited to get the pink bunny suit but since there’s no listing of what egg gives what or a group to help out, I feel a little sad because i haven’t gotten it yet. It was a great idea tho! I am sorry vor the discomfort, some of you must have had with the non working script. To make it easier, I have set up a simple box in front of my “Stitch by Stitch” mainstore where you can get your gifts finally, without egg searching and all.